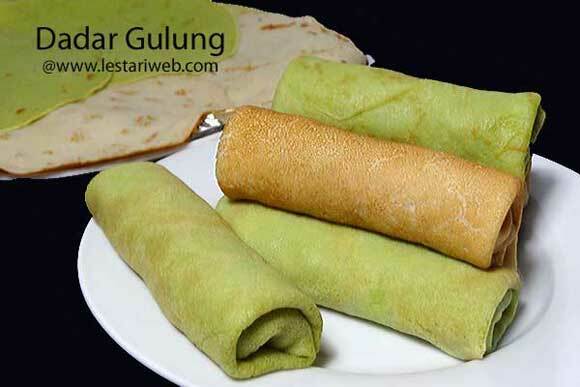 Dadar Gulung is one among the popular snacks & desserts in Indonesia, especially in rural villages of Java island. In my childhood time, I've seen this sweet dessert everywhere, homemade by my grandmother, by the street vendor in traditional markets or special cake & dessert shops. History suggested, this dessert is an adaptation of european pancake that the Dutch has introduced to Indonesian during the colonialism era. But my ancestor have modified it into indonesian variant and replaced some ingredients with local ingredients which're very easy to obtain. 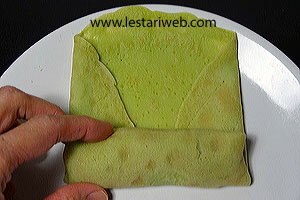 Here is whole milk replaced by coconut milk, combined with sweet grated coconut as a filling. Though it was terrible being colonized but there is a bright side though,...at least people are forced to be taugh and more creative ;-)! Important Note : For those of you who live abroad where the fresh grated coconut is impossible to obtain, then you have to take desiccated coconut as a substitute. 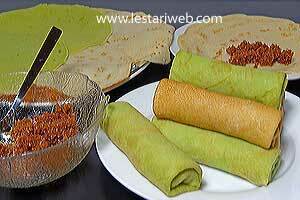 The problem is desiccated coconut contains no more coconut milk which required for the filling. As a result, the coconut filling will be relatively dry & almost tasteless. But don't worry !! After many times of "try & error" experiments, I found a simple trick to overcome this problem. Just add very thick coconut milk as I write on the recipe into the filling. I assure you, the coconut dressing will be soften, moisted and more tasty. Tipp: The above mentioned trick can be applied for other recipes as long as fresh grated coconut is required for example Urap-Urap. Just take the half amount of fresh grated coconut as described on the recipe and replace the other half with thick coconut milk. For example 300 gr fresh grated coconut = 150 gr desiccated coconut + 150 ml thick coconut milk. 50 ml/2 oz thick coconut milk (or whole milk) if desiccated coconut is used. 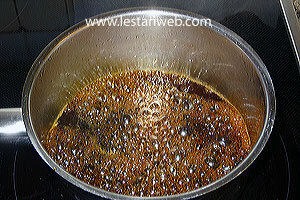 Making the Filling:Put the palm sugar & water in a small saucepan & bring to boil over medium heat. 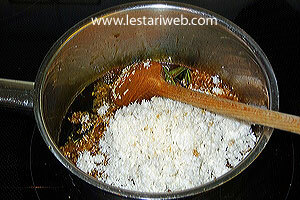 Add the fresh grated or desiccated coconut, a pinch of salt & stir to mix. 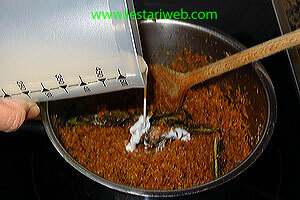 Stir all the time until the mixture is fully absorbed & you get a moisted coconut filling. Remove from heat. 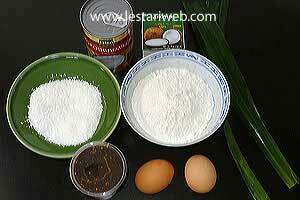 If you use desiccated grated coconut, add the extra coconut milk or milk as described in the recipe. Stir brieftly to mix & remove from heat. Put aside. 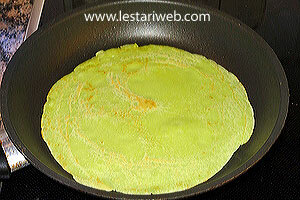 Making the green colour - Skip this step if you preffered natural pancake, add vanili essence instead. 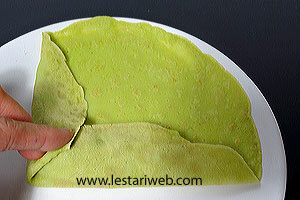 Wash the pandan leaves, chop or slice & put in the blender or food processor. Add 100 ml cold water & blend until the leaves turn to fibres & the water becomes green. 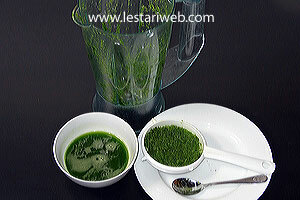 Strain the mixture with kitchen sieve, squeeze the fibres/pulp with your hand if necessary to obtain the pandanus juice. Discard the pulp. 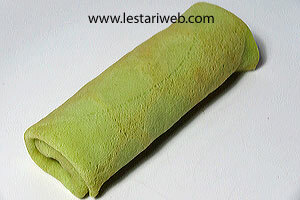 The pandanus juice ready to colour your dessert or cakes by adding the juice into the batter or dough. 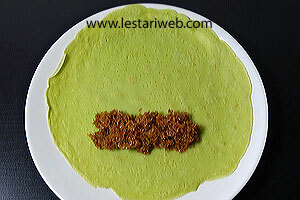 If necessary, reduce the amount of coconut milk or milk according to the amount which is replaced by pandanus juice to avoid "too thin pancake batter". 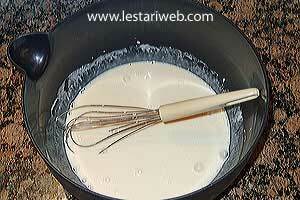 Making the Pancake: Mix the milk, eggs & salt and pandanus juice (if used) in a mixing bowl. 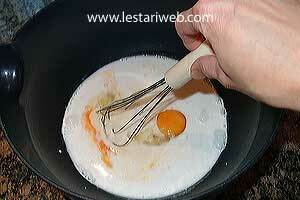 Wisk manually to perform a smooth batter. Do not use electric mixer otherwise the batter will swell too much which is not necessary ;-). Add the flour & mix throughly. If necessary strain the batter with the kitchen sieve to remove any lumps. (If available strain the batter into wide-mouth measuring cup which enable you to pour-in the batter directly onto the pan instead of scooping it). Put a non stick pan or skillet (diameter 20 cm/8 inches) over low heat and lightly grease with small amount of butter. 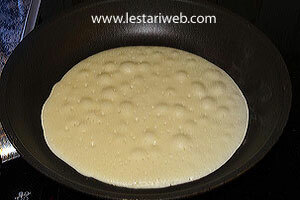 Stir the batter & laddle onto the pan evenly, turn the pan around to obtain a thin & round pancake. (The pancake is sets when the side towards the pan is done and the bubbles on top of the other side or batter side which towards you have burst and left small holes. Make sure that the bottom is nicely browned before you flip it up). 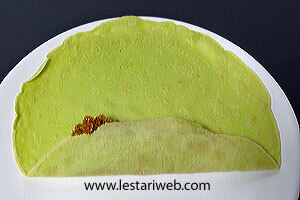 Wait until the pancake sets, flip it over with the kitchen tool or wide spatula & let it cook for few second only. Remove from the heat. Make the pancake until all the batter used up. Serving Method: Place a pancake in a flat surface or plate. Top up with about 2 tbsp coconut filling somewhere around in bottom of the pancake in a thin long shape, avoid touching the edges. Leave the bottom few centimetres clear. Fold the pancake over the filling. Fold over the left and the right side simetrically. Then roll it up to form a tube/silinder. 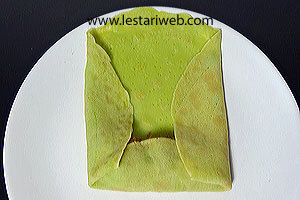 See step by step folding the pancake as described on the pictures attached. Proceed all the pancake until finished. It makes about 12 pancakes. Serve right away. Without adding extra coconut milk or milk into desiccated coconut (if used) you'll get relatively dry coconut filling, almost resembles to caramelised grated coconut & It's tasteless. So don't skip it otherwise you'll ruin the taste ;-). Add the extra milk at the end not at the beginning otherwise the filling will be lumped.